Taiichi Ohno was the Toyota executive largely responsible for structuring and implementing the system known today as the Toyota Production System over four decades after World War II. Ohno was known for drawing a chalk circle around managers and making them stand in the circle until they had seen and documented all of the problems in a particular area. Today the “stand in a circle” exercise is a great way to train one’s eyes to see waste and to provide structure for the team leader to do daily improvement or for the busy executive with limited time to go to gemba. When you spend time on the gemba standing in the Ohno Circle, you will see the gap between the target condition and the actual condition. It’s time to decide where to start first in closing this gap, using the Pareto principle. In 1906 Italian economist Vilfredo Pareto simplified the world for us with his 80/20 rule, or what is known as the Pareto principle. This is most often expressed in a Pareto chart. Identify the vital few that will give you the biggest impact towards closing the gap between current condition and target condition, and when that’s done, move onto the next tallest bar in the Pareto. To focus on addressing the root causes of the top 20% factors that are keeping your from hitting the target, the next step is to dig deeper into the root causes using the Ishikawa Diagram. The Ishikawa Diagram (also called the fishbone diagram or cause and effect diagram) was introduced in the 1960s by Kaoru Ishikawa. Ishikawa pioneered quality management processes at the Kawasaki shipyards, and in became one of the founding fathers of modern management. The diagram shows the causes of a certain event or condition. The Ishikawa Diagrma is one of the seven QC tools including the histogram, Pareto chart, check sheet, control chart, flowchart, and scatter diagram. It is quite a flexible tool. Root cause analysis can be conducted for manufacturing or production-type processes using the 4M (man, material, machine, methods) or sometimes up to 6M (add mother nature, measurement) as well as 4P (price, promotion, place, product) for a marketing and sales kaizen. Now that you have identified the root causes of your problem, you are ready to implement countermeasures. For that, you’ll need an action plan. Henry Gantt was a management consultant who popularized the project management tool known as the Gantt Chart some time around 1910. Anyone who has used Microsoft Project or who has used this classic project management tool has Mr. Gantt to thank. He revolutionized the managing of large, complex projects such as construction, worldwide when he introduced his Gantt Chart. Gantt was a very early Lean sensei in that he set the foundation for later developments such as standard work combination sheet, scheduling a day’s work and work balancing. The action plan must not be limited to “plan and do” but also “check and act / adjust” according to the PDCA Cycle, also known as the Deming Wheel. The Deming Wheel is also known as the PDCA Wheel. Edwards Deming is credited with teaching PDCA to the Japanese, but proper credit should be given to Walter Shewhart, the pionnering statistician and teacher of Deming, who originated the PDCA notion. 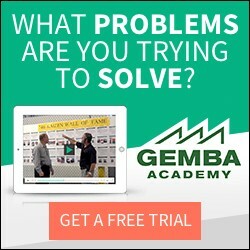 A more full explanation of the Plan, Do, Check and Act steps can be found on the Gemba Research website. One of the more powerful ways to test out your ideas through experiments is the Taguchi Method. Genichi Taguchi took the notion of R.A. Fisher’s Design of Experiments and sought to understand the influence of parameters on variation, not only on the mean. In conventional DOE, variation between experimental replications is considered a nuisance that experimenters would rather eliminate, whereas in Taguchi’s mind, variation is a central point of investigation. The diagram below shows the Taguchi Loss Function, which Ron Pereira at the Lean Six Sigma Academy explains the workings of Taguchi Method in a series of informative articles. Using these tools, you will have the data to prove that your experiment is a success! But how do you motivate people to come around to your way of thinking and adopt a new way? It might be helpful to know something about human motivation and Maslow’s Hierarchy of Needs. Abraham Maslow was an American psychologist who is most famous for the hierarchy of human needs. Maslow’s model gives us the foundation for understanding how to motivate people to change, which is a topic of great interest to us, addressed in part 1, part 2 and part 3 of a series of previous posts. Improvements made, you now need a way to check and audit the process regularly so that the process does not revert to the old way, and that new problems are discovered quickly. The Oba Gage is a useful means to enable a visual workplace for abnormality management. A 4 foot tall Japanese Lean sensei named Mr. Oba was notorious for insisting that nothing in the factory be taller than his eye-level This resulted in the “Oba Gage” for a visual workplace. The idea is to avoid creating view-blockers in your workplace whenever possible. It is also called the “4-foot rule” or “1.3 meter rule”. The workplace is more visual, many large problems have been solved and the process is stable. But how can we avoid complacency and keep continuous improvement going? H.W. Heinrich taught us through his Heinrich Principle that we must pay attention to even the smallest of safety incidents or so-called “near misses” if we want to find the root causes of what could become larger safety accidents. The same principle applies to 5S, the elimination of waste, and awareness of quality problems. Lean management means everyone is vigilant about even the smallest problems. This requires constant education and attention to maintain a heightened sensitivity and avoid habituation to the warusa kagen (condition of badness). The first nine tools used properly will result in improved safety, quality, cost and delivery. This will also open up capacity in your company to develop and deliver new products and services. But which products and services will give you a market advantage? The Kano Model helps you answer this question. When we go back to the beginning in the cycle of continuous improvement, we have to ask again “What does the customer want?” Professor Noriaki Kano gave us a model to answer this question more effectively. The chart below illustrates how there is the Voice of the Customer (spoken needs) as well as what is sometimes called Mind of the Customer (latent or unspoken needs). Quality Function Deployment (QFD) makes effective use of the Kano Model, as does fact-based Hoshin Kanri (policy management or Lean strategic planning). C2C Solutions offers a Flash tutorial of the Kano Model, about 8 minutes long. You might ask why to include a Professor who developed a model largely used for product development and strategic planning on this list of improvement tools named after Lean sensei. If we follow Pareto’s Law, 80% of the waste in a product is in the design phase and likewise 80% of the waste in management effort is probably in misdirected or unaligned strategy. So although the Kano Model ranked at #10 on the list because it is far less practical and hands-on useful on a daily basis than the other nine, one could say that it has the biggest potential impact on the overall system. There are many tools in the world. Knowing how to use them is important, but even more important is knowing how to put them to use as an overall system in such a way that helps people see things in a new way, to change how they think and work. Great stuff Jon. I especially liked the Oba Gauge… that was a new one to me. Great Article! I am happy you found our 8 minute tutorial on the Kano Model. For those interested in seeing how the Kano Model fits into a product development process, click the following link. Now I will tread the above line. i did the ohno circle method. fixed my problems and then sent the vice president, plant manager and general supervisor my study and explained how to do it. They then passed it to the supervisors, one got very upset and confrontational about the waste I observed in his area. He said “How can you expect These guys to do the amount of trailers (thats what we build) and to try and eliminate waste at the same time. We cant afford to take a drop in production. If the owners seen this study they would say we do 54 trailers a week now, we could do 70 if we eliminated this waste.” !!!??? I was in shock. exactly i said to him. Then he began pointing out the things on the list that i shouldn’t have wrote down. i explained to him we don’t pick and choose what waste we want to observe. we see waste for what it is and fix it. He was under minding my lean principles and i was truly in shock. i would like a response to this posting please. i would like to see your reactions. this site is helping us turn the company around. That’s quite the experience. I’m sure that scene was repeated many times at Toyota in the 1950s and all over the world at other companies today in early stages of Lean implementation. This supervisor had a perfectly reasonable reaction, but it was based on a misunderstanding. The key is communication. People like to know what’s expected of them, and this supervisor may now feel that he is expected to a) meet delivery, b) eliminate waste, and c) ramp up to 70 units per day all at the same time. That probably seems muri to him. Even if your workforce doesn’t have 100% understanding and agreement on Lean, you need 100% acceptance that waste is bad and that it will be eliminated. Since you have stood your VP, plant manager and general supervisor in the circle it sounds like you have top level support. Get them to make a strong statement, in person, to the workforce. Make it a positive message of growth and improving safety, quality, delivery, cost and making work more fun. Make it clear that “we WILL do this” but don’t add fear to the equation. Perhaps “We will succeed together at our company by getting rid of waste. If you plan to hold onto waste, please take it with you to our competitor.” If you’re not confident that your senior managers can or will deliver an appropriate message, find someone credible who is respected by the workforce and persuade them to deliver this message. Take a few minutes to explain what the 7 types of waste are to the workers supervisors of the areas that will be observed. The Toast Kaizen video is a good way to do this in about 30 minutes if you’re not comfortable yet being a Lean trainer. Finally, rather than arguing or fighting with people who point out wastes that you shouldn’t have written down, become their advocate. Ask them “why?” (5 why) for each of their objections and you may learn the reason it was either inconvenient or inappropriate to write down some of those wastes, in their mind. This may identify misconceptions about Lean, waste, or the expectations placed on the supervisors. This is a great way to make what’s in the minds of your supervisors visible! Keep asking why until you can state their concern back to them and they are confident that they have been understood. Then see what you can do about helping to remove these perceived or real problems, getting management involved as necessary. Please keep in mind that I have no idea about your workforce, management or the culture of your company and these are general statements of what I would do in your situation. Hopefully it helps, but you may be in for other shocks and unexpected reactions if you take this advice without running it past your BS detector first. Your article is both very educational and informative. I have become hooked on Lean & Six Sigma principles, and would like to learn more. I believe Lean to be a leading-frontier for organisational success and a dynamic management style. I work within the healthcare system (NHS) in the UK. My work focuses on increasing throughput, decreasing missed appointments, reducing waiting times, enhanced interdepartmental collaborative work, achieving greater engagement with patients, clinicians and senior management, change management, etc. I am fairly new to the land of LEAN. Have you any advice on the application of Lean within healthcare systems? In particular to areas within my work. My advice on how to apply lean within healthcare doesn’t differ a whole lot from how to apply it within any other work environment. Much of that advice you’ll find scattered through this blog. I recommend reading Sobek and Jimmerson’s “A3 Reports: Tool for Process Improvement” as one approach to applying lean thinking in healthcare. Mark Graban at http://www.leanblog.org is an active lean consultant in healthcare, so you may get a more pointed answer to your question if posed to him. I was amused by the Oba Gauge. I am a 5′ 2″ women that used to work a store manager for Home Depot in Mexico, and one of the rules we used was the 1.2 meters height to do merchandising on the hallways . The idea was to show the products but at the same time not to obstruct the visibility. I guess these tools are not just used in manufacturing. No surprise the Toyota and Honda factories in Ontario, Canada thrive, while we pay off GM and Chrysler to go home! Ontario should’ve, Could’ve got the Fiat factory too, but Fiat lacked the guts to go it alone, and will go down with Chrysler, like an anchor on a submarine for it! We have socialized medicine, good cheap schools, and healthy living, clean, moral, and for the better part, sober and drug free people from good homes seeking modest wages in a lower cost, NO McMansion environment. We have huge untouched land for factories and workers homes, a factory worker tradition, and are willing and able to do anything that gives us a modest, peaceful, and fair living! The Chinese may bless us with an assembly plant or two in the future, due to our import/export laws, but we had hoped to build Fiats, from scratch, to sell world wide, and we are up to it, government backed and wanted Fiat! All of the above principles are taught in our community colleges, along with a few we don’t make particularly public. We respect employers, especially those who are honest with us and can make a company rich in very little time! We have principles too!